Kill To Get Crimson was made with a select group of musicians including long-time collaborators keyboard player, Guy Fletcher and engineer/co-producer Chuck Ainlay. 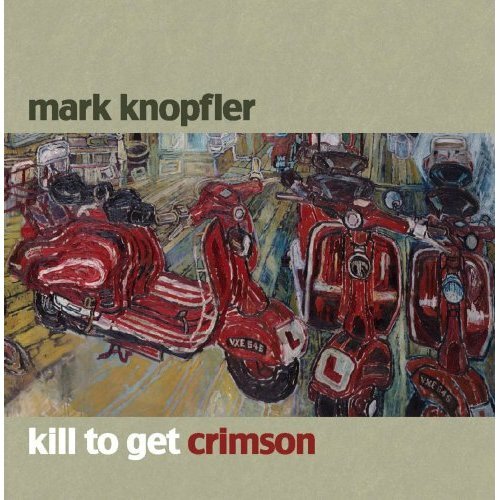 This is Knopfler’s fifth solo, non-soundtrack release, following 2004’s Shangri-La, and arrives on the heels of Knopfler’s fantastic collaboration with Emmylou Harris, All The Roadrunning. That record was Grammy nominated and also led to a series of sell out dates across the world and marked the return of a major guitar star. What I love about the former Dire Strait is that he doesn’t just tread water like a lot of his contemporaries, but actually tries to broaden his musical horizons with every release. Recorded in his own, purpose-built studio, Kill To Get Crimson contains selected traditional instrumentation as well as the more usual guitar, bass, drums and keyboards. Featured players include accordionist Ian Lowthian, with whom Knopfler played on the soundtrack to the 2002 movie A Shot At Glory, and fiddle player John McCusker, perhaps best known for his work with Kate Rusby. In the past, Knopfler combined his wry lyrics with his guitar prowess to create such major hits as Money For Nothing, Sultans Of Swing, Romeo and Juliet and Walk of Life. He has produced records for Bob Dylan and Randy Newman as well as scoring several films including Local Hero and The Princess Bride. With this present release, the trademark sound is still there but it’s more current and mature than ever before and it’s a great follow-up to his countryfied last outing. What can you say about Status Quo that hasn’t already been said? For more than forty years they’ve been rocking all over the world with their characteristic three-chord power pop. The critics have lambasted them for refusing to shake this well-trodden template, hence the tongue-in-cheek title of this, their 33rd studio album. 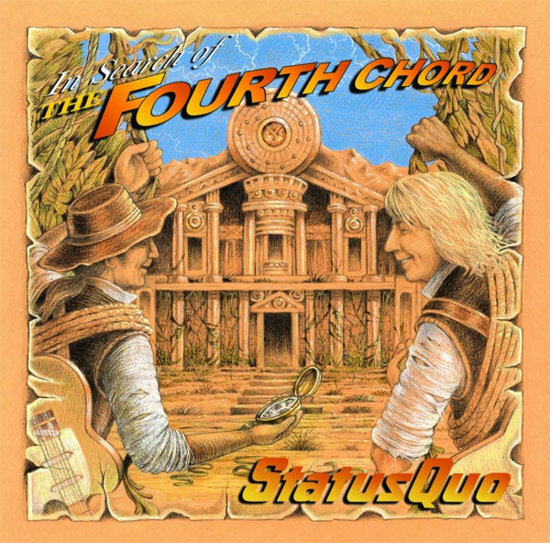 While it may be lacking the instant hits of old, In Search of the Fourth Chord has a diverse range of toe-tappers that will no doubt satisfy the majority of their many hardened fans. Opening track and lead single `Beginning of the End’ is Rossi and Parfitt at their bluesy best, while tracks like `Electric Arena’ and `Tongue Tied’ offer a more laid back, introspective vibe. Elsewhere, in a surprisingly refreshing twist, bassist John `Rhino’ Edwards even gets to sing on his own song `Bad News’. This release isn’t going to bring the Quo legions of new fans, but it will please those that pack out the arenas year after year. Rock on! Filled with lush melodies, powerful lyrics, catchy hooks, and – above all else – Lennox’s signature passion, Songs of Mass Destruction is a masterpiece and her best work since Sweet Dreams hoisted Eurythmics to worldwide stardom. Though she has had some success as a solo artist, the albums to date have always been patchy despite the strength of that voice losing none of its impact over the years. This is an album proclaiming the importance of activism, self-love, and hope in a world that has otherwise been destroyed by lies and pain. It calls out to sisterhood – and to the goodness within humanity – to stand up and make a difference. Songs of Mass Destruction declares a need for change, and asks us – each and every one of us – to open our eyes, to seek truth and justice, and to analyze the situations in our own lives. In it, Lennox also speaks directly to the women of the world, urging us to make a change : for ourselves, as well as our children. Some of the best tracks include “Ghosts In My Machine” a delightfully upbeat and soulful number featuring lyrics of “oh come and set my spirit free… I’ve seen too much, I know too much, I hurt too much, I feel too much… Womankind was born for pain, my soul keeps hurting just the same…” Feminists will absolutely adore the tracks that call out, specifically, for sisterhood: “Womankind” and “Sing” (“sing my sisters, sing / let your voice be heard / what won’t kill you will make you strong / sing, my sisters, sing”) featuring surprise performances by Madonna, Joss Stone, and others. Music lovers period will enjoy the artistic musicality, intelligent lyricism, and downright catchiness that is Songs of Mass Destruction; for an album with such an intense message, it has an upbeat charisma that emotes with love and hope. As opposed to Lennox’s previous album, Bare, in which her voice soared but the music was darker and more subdued, here in Songs of Mass Destruction, she manages to relate the state of the world and who we are as humans along with an uplifting collection of songs that encourage us, as humans, to carry on. As political as the woman herself, this is an album that dares to step beyond the usual boundaries of the pop world. When I first heard of this collaboration, I could hardly contain myself : my favourite rock singer recording with my favourite country singer? What a great idea ! Let me hear it : NOW !! They first performed together in 2004 at a Leadbelly tribute at the Rock and Roll Hall of Fame in Cleveland, but it took several years before they found time to team up in the studio with the legendary T-Bone Burnett in Nashville and Los Angeles. Among the tracks are the Everly Brothers’ “Gone, Gone, Gone (Done Moved On),” Tom Waits and Kathleen Brennan’s “Trampled Rose” and “Please Read the Letter,” first released on the 1998 Plant/Jimmy Page album “Walking Into Clarksdale.” With a stellar cast of supporting musicians, including guitarists Marc Ribot and Norman Black, multi-instrumentalist Mike Seeger, drummer Jay Bellerose and bassist Dennis Crouch, Plant is quick to define Raising Sand as more a band than a duet record. It puts the two great singers in a variety of vocal and instrumental combinations – from songs featuring two-part brother-style harmony throughout to solo features for each. 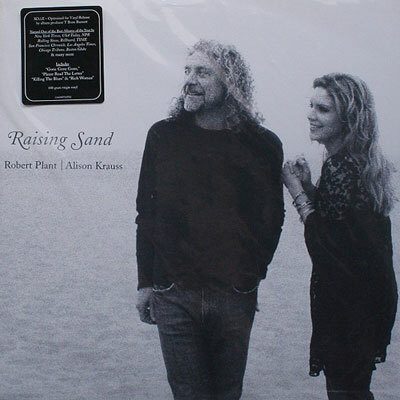 Though they come from entirely different traditions, Alison Krauss and Robert Plant create an amazing, unexpected and entirely new sound when they sing together. This is right up there with the Mark Knopfler/Emmylou Harris collaboration for me and hopefully will see the continuation of the country/rock crossovers for years to come. Yeehah! 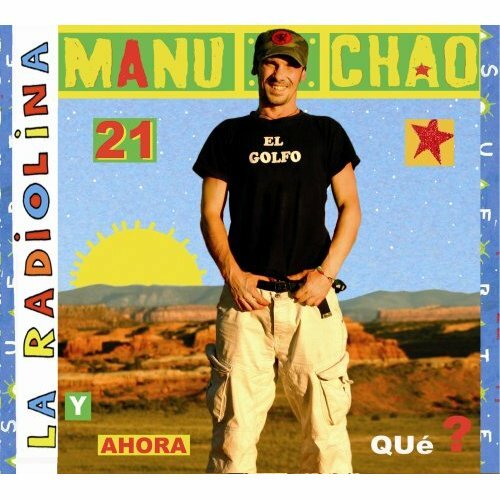 It’s been six years since the globe-trotting world music superstar Manu Chao’s last studio album, and what emerges on “La Radiolina” is a sound that is familiar to fans of his past albums, but more urgent and complex than before. As with the acclaimed “Clandestino” and “Proximo Estacion: Esperanza” albums, Chao delivers his signature stew of rhythmic rock, ska and Latin with chunks of world music influences thrown in. The former is the best-selling French album of all time, overtaking even the vast canon of Serge Gainsbourg’s back catalogue in the process, and his blend of funky vibes, gypsy rhythms and catchy hooks are well to the fore on this latest release. There are the splashes of thematic sounds that come in and out of songs throughout the album, such as a blaring siren that pulses under the groove of several songs on this 21-cut collection. The siren and the driving punk guitar riffs heard repeatedly across tracks send the message that Chao is now urging his audience to open themselves to his message about the dangerous state of the planet. There is an inescapable intensity on “La Radiolina,” both lyrically and musically. The layers are deep and new elements emerge on each listen. The aural kaleidoscope of sounds, instruments, voices demands that the listener be prepared to pay attention. If you’re on the lookout for something different, check out Monsieur Chao now. Ciao !